The themes for the 2019 Star Wars Rival Run Weekend have been announced. The runDisney Kessel Run Challenge can be completed with the Star Wars Rival Run Half Marathon and the Star Wars Virtual Half Marathon. The virtual half marathon theme with be droids and will feature R2-D2. Participants of the 5K, 10K, Half Marathon and Challenge who register by January 15, 2019, will be able to choose their side, and it will be revealed through the design of their race bib during the race weekend. 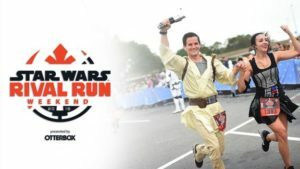 There are still spots open for the 2019 Star Wars Rival Run Weekend which is April 4-7 at Walt Disney World. Find more details here.